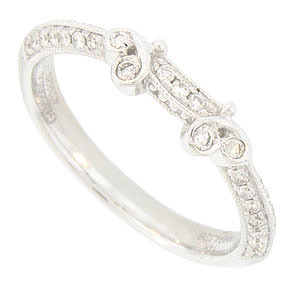 This antique style curved wedding band is crafted of 14K white gold and set with faceted round diamonds. The sparkling diamonds cover the center swag and sides of the band. 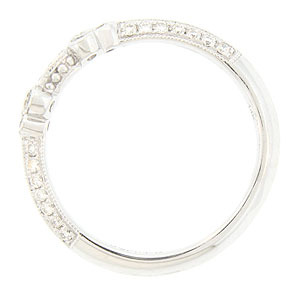 The lines of the ring are frosted in a delicate milgrain decoration. Photographed here with R2668 (sold separately). The wedding ring measures 3.85 mm in width. Size 6 1/4. We can re-size or reorder in other sizes. 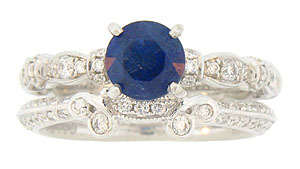 Frequently sold as a pair for $1320.00, the band is also available individually.